At the end of last year I committed to run my first marathon before the end of 2013. In March I duly signed up to run Amsterdam on October 20. Training went well during Spring and into mid Summer with a number of half marathons completed and long runs, up to 40k. Then a bit of a calamity, with a metatarsal stress fracture rearing its ugly head to be made worse by my stubborness to keep on running without consulting a doctor. So 3 weeks after the first symptoms with 2 half marathons completed, the x-ray results confirmed the worst and running was ‘banned’ for 6 weeks from the last one, which took me to the day of Amsterdam. I still harbored hopes of doing it, but after 2 weeks without the slightest hint of improvement I had to accept the inevitable. 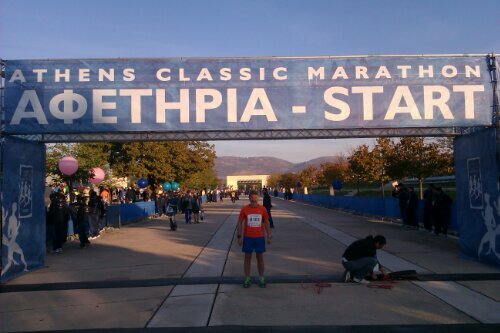 I felt incredibly down , but then discovered the Athens Marathon was still open for registration. Despite not even being sure I would be recovered enough for it, 3 weeks after Amsterdam, and the course being so different to that flat runner friendly one, I entered. So even though I had only completed 2 Parkruns and a gentle 11k in the previous 9 weeks, at 9.00am I was on the start line, well in the white pen 100m behind it, with 12000 others. White was the last starting group, designated mainly for those, like me, withou any marathon pedigree. I am assured that everyone is nervous, with good reason, before a marathon; even Jon, my son-in-law for whom this was to be marathon number 89 confessed to this. I did not sleep well for the 2 nights before but was remarkably composed while waiting the hooter. I think it was because there was a 8 hour cutoff and I reckoned that even if I had to walk most of it, barring catastrophic injury I would somehow finish. I really did start almost at the back, reasoning that I therefore couldn’t get overtaken by many runners so wouldn’t get too disheartened. I started running at a pace that was certainly slower than in any race I had run before, but was still constantly passing people. I was well stocked up with gels plus electrolytes in bottles, 1 I was carrying and 2 in a running belt. I used every refreshment station and the sponges provided; it was hot, certainly in the mid 20s almost from the start. As there had been a video of the course at the expo, and the coach journey to the start was along the route, I did have an idea what to expect. Actually I was pleasantly surprised. Most of the race reports I had read on line suggested the almost unrelenting upward gradient from about 15k to after 30k made it a very demanding run, it certainly didn”t do Pheidippides much good. 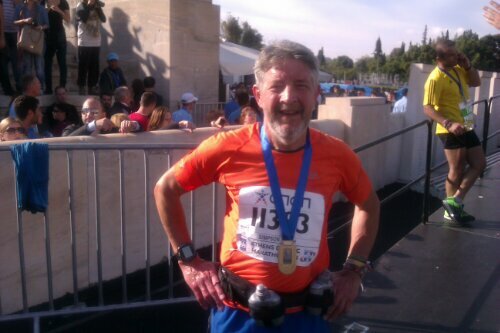 I don’t want to sound arrogant, but I plodded along quite happily through to the start of the 10k descent into Athens and the Olympic stadium without really feeling that the gradient was a problem; maybe that is because I was running well within what I might have tried if I hadn’t had 9 weeks enforced rest. I was disciplined enough not to look at my GPS watch until about 30k, and quickly realised that unless the wheels came off, which of course can easily happen in the last quarter of 42.2k, I might sneak under 5 hours, which was beyond my wildest dreams for the previous 9 weeks. I actually didn’t have to do any more I had been doing, just plod along. The closer I got to the end the more certain I became that not only would it be sub 5 hours but 4:50 was attainable. I might be a bit of a softy, but on a couple of occasions over the last k, seeing a sign held by someone at the roadside “Pain is temporary achievement lasts for ever” and into tbe stadium with crowds of people you don”t know shouting the name on your bib and cheering you on, what I was about to achieve did get to me and I had to fight to hold back a few tears. I crossed the line in 4:49:35, and am still in shock 24 hours later. There is a terrific thunderstorm going here in Athens where I am staying for a week before moving on to Cyprus for anothr week. Then to prepare for number two. Don’t be put off by the suggestions that this is a very difficult course, I honestly do not think it is. You can do it as your first, and so get a pb! Bizarrely I am pleased I suffered the stress fracture because where could be more suitable, the start line at Marathon is THE place to start your first marathon.